Worried you’ve forgotten something, that things won’t go according to plan or that the day will just whizz by? There’s nothing quite like advice and tips from somebody who’s actually been there and done it is there?! 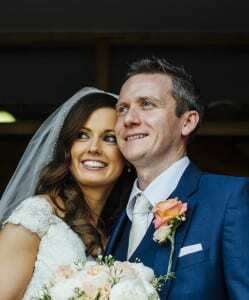 Lisa Geraghty, who married last July has some excellent practical advice for all you brides and grooms in the lead up to your big day. 1) Get WEDDING INSURANCE! It’s definitely worth it just in case anything goes wrong! (lot’s of Irish wedding insurance vendors online, it costs approx. €100). 2) Remember to get married in Ireland you have to GIVE NOTIFICATION in person of your intention to marry to a Registrar at least 3 months before the wedding day. If you get married by religious ceremony, after the wedding you should give the Marriage Registration Form within one month to a Registrar, for the marriage to be registered. 3) READ REVIEWS online before booking wedding suppliers & go on personal recommendations if at all possible. 4) CONFIRM YOUR BOOKING with all suppliers two weeks before the big day. Give a list of wedding vendors & their contact numbers to the best man. 5) GET A MASS BOOKLET off a friend! This will save you so much hassle & they all tend to have the same format. 6) Leave your LAST WEDDING FITTING as close to the end as possible eg 2 weeks or preferably 1 week beforehand if possible, it’s very easy to lose a few pounds in the rush at the end. 7) Have a wedding POST-BOX for cards & gifts. It’ll give you that extra security & avoid cards going missing etc. 8) Use a PHOTO DOWNLOAD APP eg wedpics for all your friends & family to share photos of the day on. 9) KEEP A LIST of who has sent cards & gifts beforehand as it’ll really help when you’re doing your thank you cards. 10) BREAK IN YOUR SHOES beforehand! It’s really important to be comfy in your shoes on the day. Maybe have flats to change into for the reception, no-one will see them under your dress anyways! 11) If you’re nervous about the first dance then definitely do even one DANCE CLASS so at least you’ll have a set routine to stick to. 12) Give a LIST OF YOUR FAVOURITE SONGS to the band and/or DJ beforehand. 13) If you’ve gone OVER-BUDGET remember you don’t have to pay the venue until after the big day so you can use the cards with gifts given on the day itself. 14) Make sure the venue have BLOCK BOOKED enough rooms for the night itself & the night before if people are travelling down then. My venue had a wedding the day before & gave some of my block booked rooms to last minute bookers at that wedding so some of my bridal party had to stay in a b & b instead, it was quite stressful! 15) Run a FUN COMPETITION at the tables & announce the winner with a prize eg bottle of champers for the table. I did a Fr Ted quiz & it was really good fun! 16) Have COLOURING SHEETS at the kiddies table. 16) Do out a TIMETABLE for the day itself! You won’t need to use it but it’ll help relax you beforehand.